University Classroom Building - Southeast U.S.
During construction of a university classroom building the windows repeatedly failed field water testing by the window subcontractor. These failures appeared to indicate a performance deficiency or problems with the fabrication of the windows, when, in fact, the problems were related to issues associated with the window installation. Several attempts to seal the windows were unsuccessful and the leaks continued. Ultimately, extensive supplemental flashing and caulking around the window openings and surface-applied interior sealants were successful in preventing leakage and the windows satisfied the project field testing requirements; however, the window subcontractor incurred substantial unreimbursed costs for the remedial work and extensive re-testing required to resolve the leak issues. 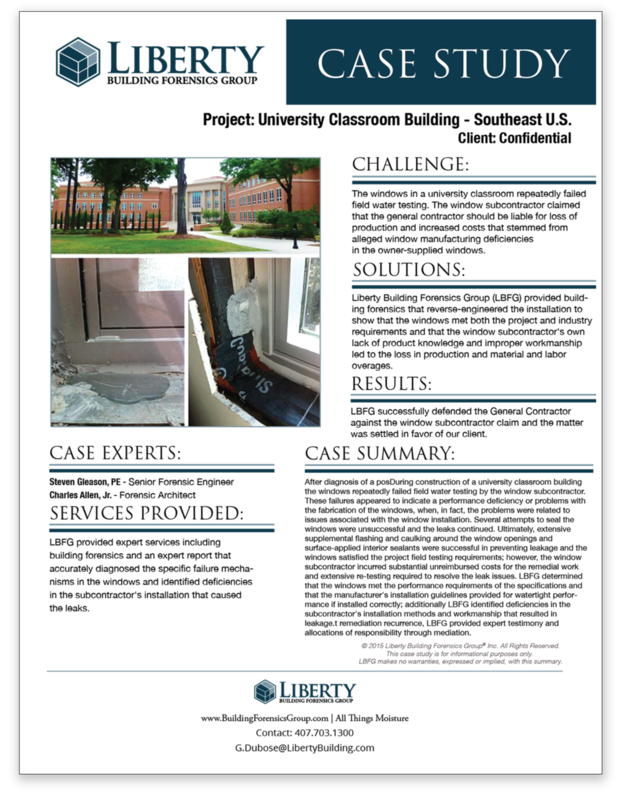 Liberty determined that the windows met the performance requirements of the specifications and that the manufacturer’s installation guidelines provided for watertight performance if installed correctly; additionally Liberty identified deficiencies in the subcontractor’s installation methods and workmanship that resulted in leakage. Custom Residence - Southeast U.S.